There are eye drops – and there are eye drops. Some eye drops are called “artificial tears” and some eye drops are called “redness relievers.” Whatever you call them, in an age of global warming, drying, drought, pollution, dehydrating “techno” environments and a rapidly growing epidemic of dry eye disease, worldwide sales of eye drops are booming. But are eye drops the very best the pharmaceutical community has to offer to control the dry eye epidemic? First of all, it is important to understand that untreated dry eye can lead to discomfort, blurred vision, headache, fatigue, loss of energy, depression, corneal ulceration, glaucoma, cataracts, eye cancer and blindness. Also, while there may be considerable room for improvement in the air quality of the United States and Europe, our air is fantastic compared to China, India, South Korea, Argentina, Brazil, Mexico and Nigeria. Nevertheless, in the U.S., dry eye symptoms have become the number one reason for eye doctor visits and over 100 U.S. cities are identified as “dry eye hot spots.” Globally, someone goes blind every five seconds, much of it related to air quality, water availability and water quality. Clearly there is a critical need for an inexpensive, safe, convenient and effective eye hydration product. But are eye drops the answer? When the eyes are dry, it means there has been a slight loss of moisture in the aqueous layer of the eyes’ highly complex protective tear film. Restore this water (two to five billionths of a liter), and symptoms vanish. Chemically formulated eye drops deliver a quantity of fluid equal to ten times the volume of the entire tear film. This can entirely wash away the existing tear film, with all its complexity and protective antibodies. And yet, eye drops contain NO water. Also – eye drops can be difficult for many people to apply (especially the elderly), the chemicals and preservatives could cause an allergic reaction and the makers recommend no more than three or four applications per day. The 21st Century approach is completely different. Instead of eye drops inserted into the eye, this approach utilizes patented micro-droplets of pure, pH balanced water applied to the air around the eye in the form of a mist. The eye absorbs this moisture in exactly the quantity it needs, with no disruption to the natural tar film structure. This system is all-natural, 100% safe, compatible with the eyes’ natural processes, non-allergenic, non-addictive and there is no dosage limit. You can mist as often as necessary, whenever your eyes feel dry or uncomfortable. 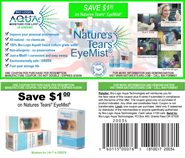 Nature’s Tears® EyeMist® -- For dry irritated eyes in the 21st Century.